Whatever your dreams related to French may be, whether you want to speak fluently, read classic literature without resorting to a translation, or travel around France, setting specific goals – and measuring your progress against them – is one of the most effective tools in your learning arsenal. Motivation and goals go hand-in-hand. Setting goals to guide your French learning is one of the best things you can do to stay motivated, and being motivated is the only way to stay on track toward reaching your goals. So it's important to plan your language learning journey: you've seen how long the journey is, so just like when climbing a mountain, it's advisable to plan the journey in stages, ideally both short term and long term. Choosing the right goals isn't rocket science, but there's a little more to it than just throwing together a list. 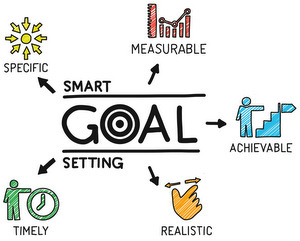 To be truly effective, goals should be S.M.A.R.T. A short-term goal can be as simple as the declaration that you'll study, say, an hour a day. To measure your progress, try an online goal tracking app - there are numerous free options available. Or you can be old school: draw seven boxes on a piece of paper and check one after each hour of study. Either way, it feels good to check things off and is a visible way to measure progress, even (especially) when you don't feel like you're progressing. Medium-term goals chez Learn French With Alexa and Kwiziq include level shields (bronze, silver, gold) and foundation awards, while reaching the next CEFR level is a very worthwhile long-term goal. Even if you don't "need" to prove your French level for work or school, why not do it for yourself? Register to take the DILF, DELF, or DALF, the official French proficiency exam. If you're serious about improving your French, you need to be serious about how – and how much – you study and practice. Making goals allows you to track your efforts, no matter how quickly or slowly you feel like you're progressing. So check out your personalized StudyPlan and visit your achievements page to see what you've already earned and figure out what to aim for next.